Kia is slowly filling gaps in its SUV lineup. It just debuted the large Telluride, and now it’s getting ready to introduce a new crossover on the opposite end of the spectrum. Our spy photographers caught this small Kia playing in the snow. Our sources say this vehicle is based on the SP Concept that Kia debuted last year at AutoExpo in India. With this information, we can connect the dots further. Han-Woo Park, Kia Motors Corp. CEO, told Automotive News that a small crossover based on the SP Concept will be exported from South Korea to the U.S. market. It’s possible that this new small crossover will share its bones with the Hyundai Kona, though our shooter believes it will be based on the global-market Hyundai Creta. Rumor has it the model will bear the name “Tusker,” although it could be called something different in the U.S. 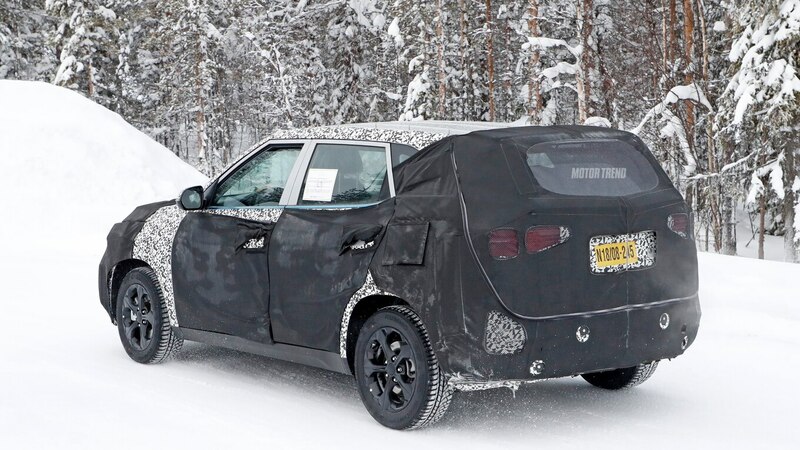 The heavy camouflage provides little indication of how the crossover will look when it enters production. The cut-outs on the front suggest a split-lighting design, but at this point, it’s impossible to tell whether or not this Kia’s true plan. The model has a rounded front face, and camouflage in the rear gives off the wrong impression of a bulky back end. The wheels, window trim, and so many other details don’t look production-spec. The model will arrive later this year, as the previous AN report indicated. The post Spied! Kia Tests New Small Crossover appeared first on Motortrend.